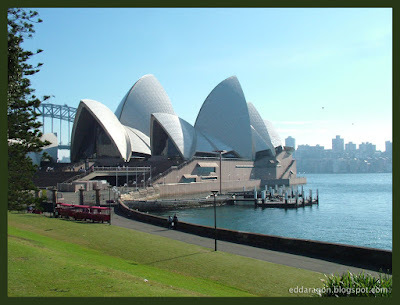 Opera, wintry Sydney, and found my eskimo self at the footsteps of Sydney Opera House last Saturday. I still get hypnotized by the energy of this structural masterpiece by Danish architect Jorn Utzon. 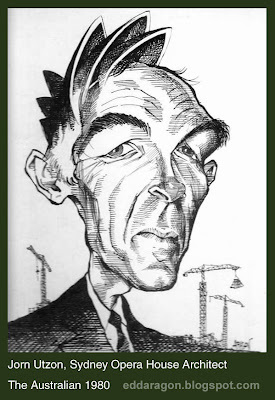 (Above) Caricature of Mr. Utzon I did in 1980 for The Australian newspaper where I first worked as a cartoonist. I took some shots as craft traders set up their booths. 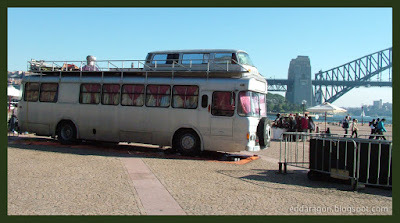 Also found this weird bus (above photo)parked right in the middle of the sacred tourist ground. If I were a gray ghost (aka parking officer) I would have double-booked this vehicle:-) Why? Well there's an extra vehicle (a Volks Kombi) welded on top of it! Check it out. 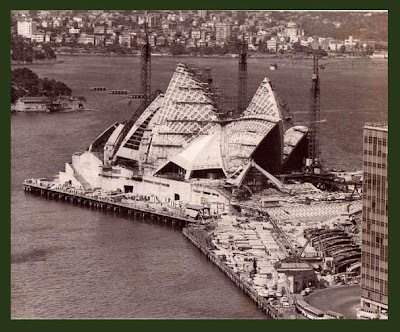 Newspaper photo above (Daily Telegraph) of the SOH under construction in 1973. The work site looked like a hopeless origami. There was much controversy building this thing, e.g. issues of overbudget which threatened completion of the building. Local architects insisted on changing some plans. 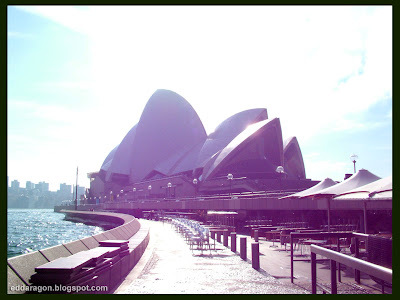 Offended, Jorn Utzon walked out of the project but eventually returned after 30 years, wounds healed and the Opera sails gleamed brighter. I've probably taken hundreds of photos of this majestic building since 1979 when I first arrived. That saturday morning there was nary a tourist around (probably still tucked in bed in their warm suites up the Big Toaster). 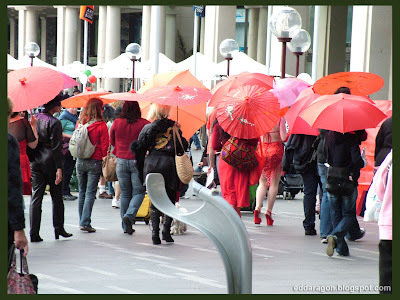 Walking further down towards Circular Quay I found a group of people with red umbrellas milling around. What's this? Women dressed in red, face masks, kitsch, a restrained voice on the megaphone and a wheelybin with a little sound system belting out songs by Ol' Blue Eyes. But what's the buzz? I heard Sophia Loren is in town. 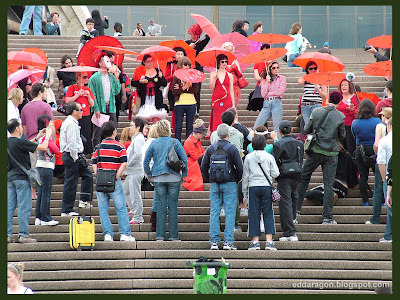 Could these women who were all dressed up like opera performers be her fans? Nope! I soon found out when they unfurled a big, red banner. By instinct I felt sympathy for these workers who despite the stigma of their profession have found courage to publicly air their desire to reform laws that restrict L' Amore attraverso i secoli. Protesters ended up on the footsteps of SOH where I was minutes ago. The group seemed like a red, floral bouquet under the giant sails. Veronica's angels scattered like rose petals and blended in the crowd. The cold wind that took time lifting up the fog at the northern shore whispered something in my ear...time to go to Dendy.